FLAME SAFE CHEMICAL manufactures a complete line of flameproof spray coatings and fire retardant penetrants that meet or exceed industry’s fireproofing standards. The effectiveness of Flame Safe’s fire retardant products are well documented. The uniqueness of FLAME SAFE’s flameproof products are not only their simplicity of application, their low cost, their environmental safeness, their tested proven certifications, but most importantly they are required by code. Fire codes are written and enforced to save lives and property. Uniquely, FLAME SAFE’s flameproofing spray coatings and penetrants are easily applied, colorless, non-toxic, environmentally safe, and are aqueous based fire retardant chemicals. 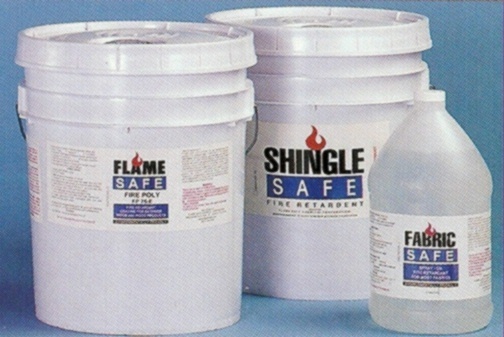 FLAME SAFE has both interior and exterior fire protection coatings, penetrants, and fire retardant sprays for wood, wood products, architectural millwork, molding and trim, lumber, plywood, wood shingles, timbers, trusses, decking, fencing, fiberglass and plastics, fabric, theater curtains, drapes, upholstery, mattresses and bedding, thatch, thatching, tiki huts, paper, cardboard and packaging systems for combustible liquids. Flame Safe's TREE SAFE is an excellent wildfire protection on dry grass and dry brush. It's application can slow or stop the advance of the flame front caused by winds in areas of exceptionally low humidityThe Fire Buster™ is a fire retardant treated fabric available for commercial and residential use. Most flameproofing products presently on the market do not have testing by accredited third party testing agencies to back their claims. Flame Safe’s fire retardant spray coatings and flame retardant products have been tested by accredited third party testing agencies such as Underwriters Laboratories, Underwriters Laboratories Canada, Southwest Research Institute, United States Testing, Western Fire Center, Forestry Commission of New South Wales Australia, European Institute for Fire Research, United States Forestry Department and Maxim Technology. 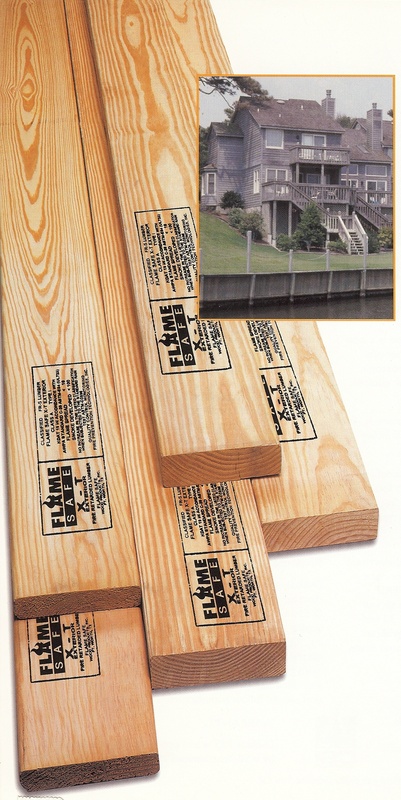 For those specifications that call for an exterior fire retardant lumber or plywood that will have exposure to the elements or high humidity conditions Flame Safe XT is the product of choice. In addition to passing the ASTM E84 test for surface burning characteristics, which all exterior fire retardant lumber and plywood bearing a Class I stamp must pass, Flame Safe XT has passed the ASTM D2898 accelerated weathering (rain) test as well. FLAME SAFE is dedicated to setting not merely following the fireproof industry standards through ongoing research development and testing programs. FLAME SAFE continually endeavors to educate the marketplace on the significance of fireproofing combustible materials through the use of flame retardant products.